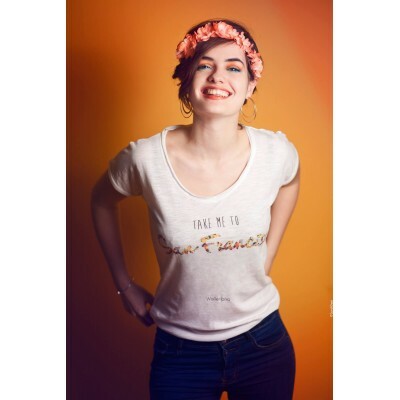 Organic cotton t-shirt "Take me to"
White T-shirt globetrotter "Take me to"
Eloïse is 1m68 and she is wearing size S. For a looser effect, choose one size up comparing to your usual size ! The t-shirt "Take me to" was created in association with the talented designer/illustrator Marie Boussard. We met on Instagram, after I randomly passed through her illustrations. I found them full of humor and poetry, and I wanted to meet with Marie right away to discover more about her designs. We eventually decided to work together on various projects. This t-shirt is one of them. The "Take me to" shirt is an ode about travel, landscapes and beautiful unknown places to be discovered. Created in accordance with our travel socks from the same collection, the "Take me to" t-shirt is also to be found in a travel kit, very usefull and light. Our "Take me to" t-shirt 100% made of organic cotton. The illustration was printed with organic silkscreen print. It represents a globe pined on various destination to go to. A paper plane is flying above it, a pair of sunglasses and a vintage camera are laying underneath. Hesitate between two sizes ? The t-shirt is cut loose with a deep round neck. The fabric is light and comfortable. Our model, Eloïse, is 1m68 and she is wearing a size S. Choose your usual size, but if you prefer it looser, try the biggest one !